“Honestly and truly” was how a friend from long ago used to start her sentences. I found it amusing. At least she didn’t end her sentences with “ya know…” I said to myself. But I’ll give in to the temptation and imitate her speech. Honestly and truly, when these muffins came out of the oven, I couldn’t get over their near-perfect shape. And you couldn’t find fault with the dome either. Yesterday, the gods must have egged me to bake muffins because they looked like they came out of a professional baker’s oven – I could have sold some to Gordon Ramsay! Of course, he’d probably say I need to go back to the kitchen and log in another 2,500 baking hours. You can make these banana and date muffins in less than an hour. I didn’t even use an electric mixer. All I had was a wooden spoon plus a knife to cut up dates and bananas. A culinary school out in the west island shared a banana and date squares recipe which I did 10 days ago, devouring it with gusto (and guilt). 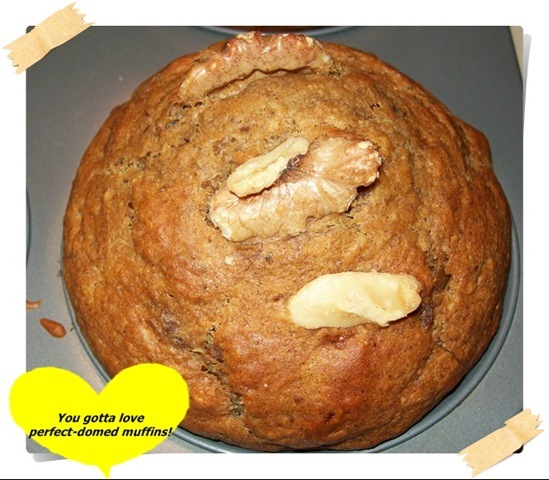 The combination of bananas and dates – both mashed to make the squares – was excellent. I decided I would take that combo and create muffins. 1. Chop each of your dates in two to three pieces and heat them in a small pot with the orange juice. Reduce heat when mixture begins to boil. Keep stirring the dates in the orange juice until it forms a paste (about 5-10 minutes – long enough for the dates to be soft and pliable). Set aside and let cool. 2. When dates cool, slice your 2 bananas and mix them in with the dates, mashing them. Ensure you blend both well. Set aside. 3. In a bowl, combine all your dry ingredients using a spoon. 4. In another bowl, combine your wet ingredients, making sure the eggs have been beaten and incorporated into the mixture. Pour into dry ingredients (or pour dry ingredients into wet ingredients, whichever bowl is bigger). 5. At this point, pre-heat your oven to 400 degrees F. In the meantime, add the milk to the mixture. The recipe calls for half a cup of milk, but I used more so I could come up with a “wetter” batter instead of a dry, stiff one. The idea is to be able to mix both wet and dry ingredients with a spoon without much effort. More milk also makes them more moist. 6. When thoroughly blended, pour batter into large muffin cups (I did not use muffin liners). The batter is good for half a dozen. 7. Decorate with a walnut or two (next time I’ll skip the walnuts because the ones I had were salty so it clashed with the taste. Perhaps pecans are a better alternative). 8. Five minutes after placing the muffins in the oven, reduce heat to 350 degrees for 30-35 minutes (or until knife inserted in center comes out clean). Tip: I’m not sure where I read it – Betty Crocker or King Arthur Flour – but the dome shape can be achieved by subjecting muffins to high heat (in my case it was 400 degrees) for the first few minutes of baking and then lowering the heat to 350 degrees. This will depend on your type of oven. 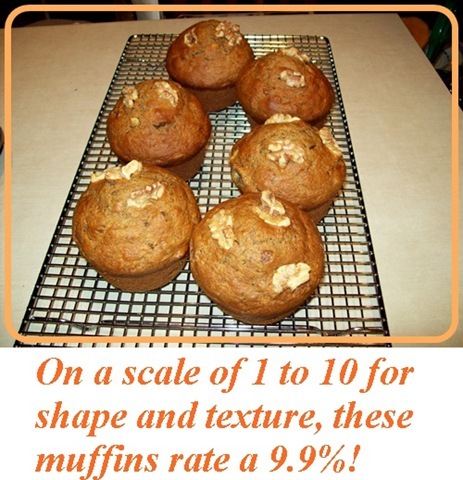 I was…honestly and truly…delighted with the texture and shape of these muffins!